The World Racquetball Tour Midwest Championships were hosted at Life Time Fitness Moore Lake in Fridley, MN. The WRT divisions were run in tandem to the Minnesota State Championships, which are held annually. With the Mexican National Championships being held concurrently, Rodrigo Montoya, Andre Parrilla, and Polo Gutierrez were all absent, which opened the door for a few locals and part-time pros to make their name on the big stage. Seeded one, Alejandro Cardona (MEX) cruised to the quarter-finals as did number two seed David “Bobby” Horn (USA) on the bottom half of the draw. In the quarters, Cardona faced an unexpectedly stiff test in Mauro Rojas (USA), a regular on the tour in 2017, and defeated Costa Rican national champion Felipe Camacho in the round of 16. Rojas seemed out of sorts in game one, but rallied in the second game to stave off Cardona’s match point and take it to a tiebreaker. Nevertheless, Cardona is number one for a reason, and while Rojas continued to battle, the Mexican asserted his dominance taking the breaker 11-6. That being said, Rojas, who is still a junior, demonstrated his immense potential for the future. Horn faced his doubles partner Jake Bredenbeck (USA), who continues to recover from a torn labrum and has been playing with his non-dominant left hand. However, after losing the first game 15-8, Bredenbeck switched to his favored side and improved significantly. At 13-13 in game two it could have gone either way, but Horn sealed it with two quick points, and Bredenbeck will be left to wonder what might have been had he begun the match playing right handed. A surprise entry to the tournament was 2014 Under-18 World Champion Mario Mercado (COL). He faced another unexpected opponent in local Minnesotan John Goth. Goth fought gamely, but the combination of a powerful serve and guile allowed Mercado to advance comfortably 15-7, 15-9 to face Cardona. In the bottom half, Jaime Martell (MEX) was back following injury. His play was much improved over his last outing where he competed with a heavily taped elbow. His opponent Mauricio Zelada (BOL) was forced to play more aggressively than perhaps is usual, and as his skip count increased, so too did Martell’s point total. Martell advanced to the semif-inals with a lopsided 15-5, 15-2 win. Horn was the first to advance to the final, defeating Martell 15-9, 15-9. There were many outstanding rallies in this match and both players demonstrated at times their almost inhuman ability to keep the ball in play. Although the score might suggest otherwise, both games were evenly balanced at times, yet Martell was made to work harder for his points. Horn serves intelligently by mixing pace, angle, and direction, and combined with Martell’s overly aggressive returns, Horn was able to capitalize on many opportunities for three-shot rallies (serve, return, finishing shot). Martell was more successful with longer rallies overall, and perhaps a defensive but more accurate ceiling ball from the serve would have yielded a different outcome. In the top half of the bracket, Mercado had multiple opportunities to win game one against favorite Cardona, but Cardona somehow managed to come back and take the first game 15-14. Mercado appeared shell-shocked from the outcome, and Cardona raced away to a 10-0 lead. Then, on the brink of elimination, Mercado turned it on, and with a combination of his improvement and a dip in Cardona’s, he battled back one point at a time. This time it was Cardona who was left to wonder what if: Mercado refused to quit, saved match point, and took it to a tiebreaker with yet another 15-14 score. The tiebreaker could have gone either way, and there were some stunning rallies and shots by both players. At 5-5 in a game to just 11, the match came down to just one or two mistakes or moments of inspiration. As Mercado edged forward, the psychological pressure for Cardona to respond was immense. He could not, and eventually succumbed 11-6. The final was a contrast of styles. Horn is the counterpuncher, relying on his defensive skills and at times unorthodox play and pace to keep his opponent off-balance. Mercado has a classic style, but enjoys, at times perhaps too much, his pinches and splats. While certainly crowd pleasing, if not hit well they typically bounce back to the middle of the court. Similar to his semi-final, Mercado started the match sluggishly, and Horn looked the hungrier and fresher of the two. But again, somehow, Mercado fought back and found himself at game point. In fact, the first game was on his racquet: an easy put away in the center of the court was all that was needed, but he chunked it squarely into the floor. Two unreturned serves later, Horn was the 15-14 winner. Just like his semi-final, Mercado seemed to be thinking about his missed chances, and quickly fell behind 8-0. But in an almost deja-vu manner, he rolled off four quick points and we had a game. For every point Horn won, Mercado won two, and eventually found himself serving at game point to extend the match to a tiebreaker. Then, once again, he put what he would consider a very simple finishing shot into the floor. Horn needed no further luck and closed out the second game and the match 15-14. The final was a clear indicator how important small differences can make in an outcome. Horn was mentally tougher on this occasion, and Mercado’s lax play during the early part of both games cost him dearly. That, combined with his relatively simple opportunities to take both games, highlights that some points are bigger than others, but only because they are interpreted as such. As demonstrated by Horn, wins are not just built on physical skill, but on mental skill also. 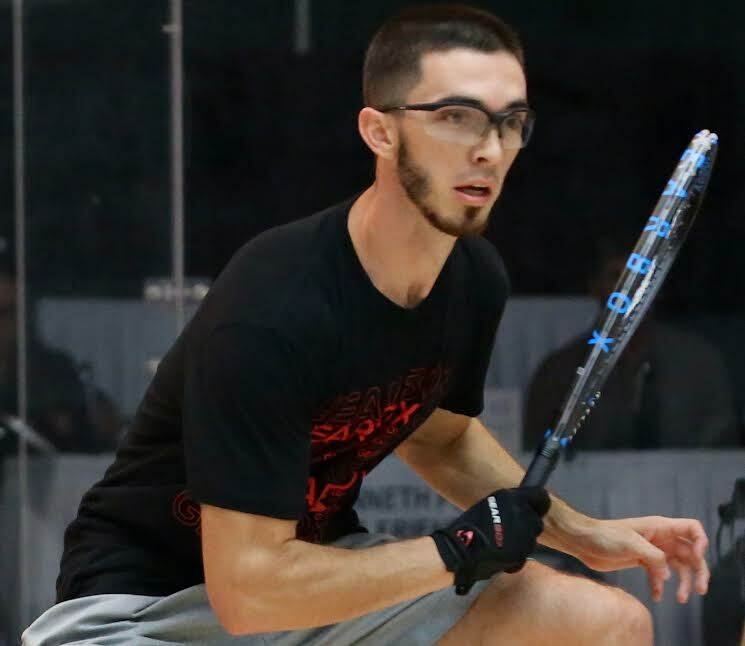 Following a break for the Pan American Championships (www.internationalracquetball.com) in Costa Rica from April 8-15, the WRT resumes its schedule May 5-7 in Atlanta GA for the Georgia Open.